Gone with the Wind, Fabulous! How hard is it to look and feel good? The answer is simple: as hard as it is to blink. The good feeling and look has to be internal. Feed your mind positive thoughts of yourself just as much as you feed your body food. If you do this, no matter which way the wind blows you will be gone with the wind fabulous! Hat: Francesca’s. Dress: Primrose BoutiQ. Shoes: ShoeDazzle. Sunnies: Moorea Seal. How much do l love that dress?… very, very much! Gorgeous color on you and the shoes look fab! Well put together. That dress is definitely gone with the wind fabulous. I love the color and fit on you. I always have to get long dresses altered because I am so short but you make this dress look worth that effort. Thanks Tia! I love maxi dresses! Love everything about this dress. It is perfect for any time of the year. You are a fellow skinny like me so I already know it would be flattering on my frame. Thanks Mimi! ☺️ I love being a skinny, lol! Yes you were Working these looks!! I love that dress and combining with those glasses and shoes was just fabulous. So beautiful! That dress is gorgeous on you!!! Love the color! Blush pink is one of my favorite colors to wear! 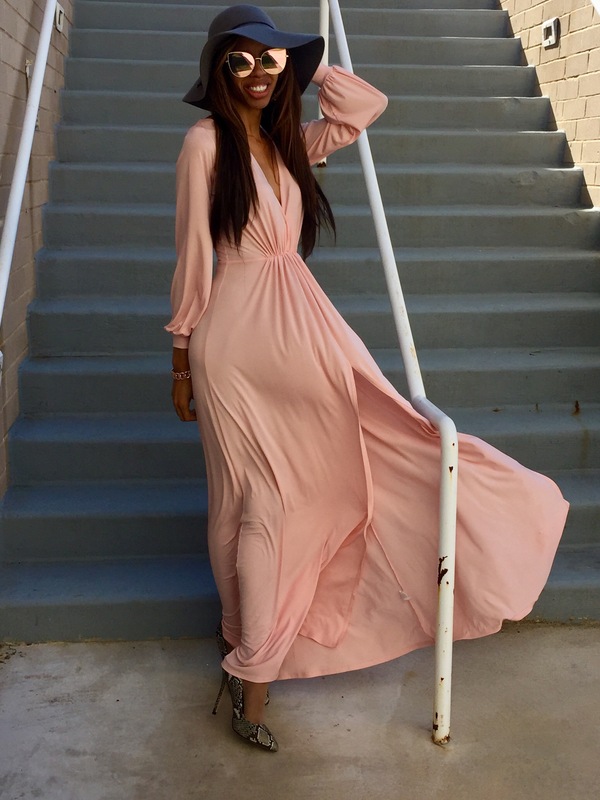 I love the movement in the dress and this blush pink is great on your skintone! Beautiful subject. Beautiful dress. It looks like it has a really flowy style and I love it! This dress is so gorgeous. And you’re right – if you feel good you look good. Super cute maxi dress. I love the soft blush color. You paired it with a perfect pair of heels. Yes sis! I love it! If only my legs were that long…gorgeous! That dress is cute and that color looks fab on you. Love it alll! I need this in my life!! You look amazing. When you look good, you feel good and it’s showing. Keep slaying, sis! Wow that is an amazingly beautiful dress. So whimsical I love it and you look very good in it! 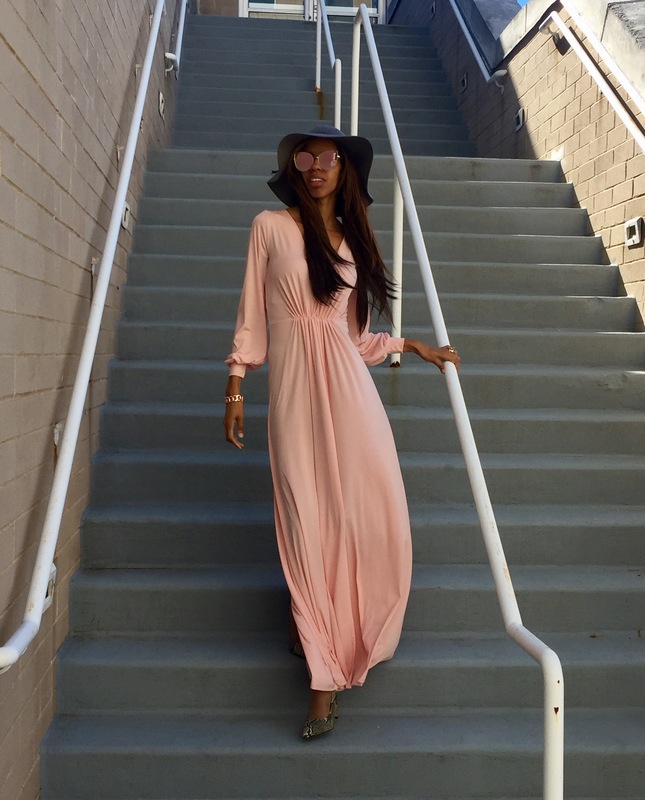 This entry was posted on October 24, 2016 by LaQuisha Hall in All Dressed Up, Brand Ambassador, Dresses, Francesca's, Hat Attack, OOTD, Primrose BoutiQ, Shoe Dazzle, Shoe Spotlight and tagged fashion, fashion blogger.